Twelve Dubai hotels won across 24 award categories to dominate the Middle East Hotel Awards 2016 this week. Dubai, UAE, June 1, 2016: A total of 70 hotels and hotel suppliers from across the region were shortlisted. Other winners came from Abu Dhabi, Ras Al Khaimah, Saudi Arabia, and Bahrain. 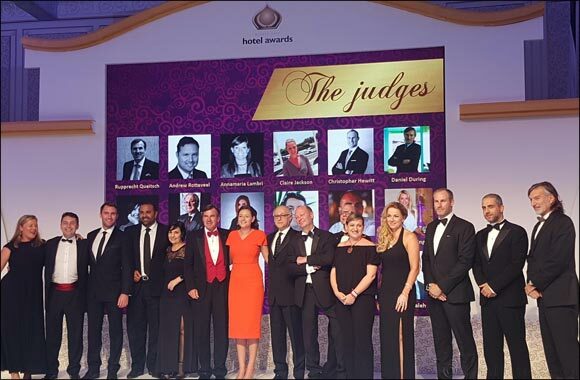 More than 400 hoteliers from throughout the Middle East attended the awards ceremony (24th May 2016) at the Palazzo Versace Dubai, which took away the award for Best New Hotel 2016. Speaking at the venue, Sandra Tikal, General Manager of the Palazzo Versace Dubai described the award-winning new hotel as an “urban resort” as well as a “true European palace with an Arabic edge”. Kempinski Mall of the Emirates , which unveiled its US $100 million (AED368m) refurbishment in 2015, won across two categories: Best Hotel Suite and Best Hotel Renovation/Refurbishment. The hotel boasts unique ‘Aspen Chalets’ with rustic interiors, ‘crackling fireplaces’ and views of the Ski Dubai indoor ski slope, for an exclusive ‘winter wonderland’ in the desert. Level 43 Sky Lounge, Four Points by Sheraton Sheikh Zayed Road won the Best Middle East Hotel Bar award for the 2ndyear running. A pool bar by day and lounge bar by night, judges commented that the spectacular, 360 degree views of Dubai’s skyline and personalised service could not be paralleled. Dubai winners in new award categories introduced for 2016 included: Atlantis the Palm, Dubai (Best Family-Friendly Hotel); Huddle Sports Bar & Grill, Citymax, Al Barsha (Best Sports Bar); and Asado at The Palace Downtown (Best Al Fresco Dining Experience). Other, coveted new award categories for 2016 were won by hotels in Ras Al Khaimah (Waldorf Astoria Ras Al Khaimah -Best Luxury Hotel) and Bahrain (CUT by Wolfgang Puck at the Four Seasons HotelBahrain Bay – Best Fine Dining Restaurant). After the presentation of the ‘Best Eco Initiative’ award, its category sponsor MODUL University Dubai made an announcement launching the Middle East Sustainable Tourism Education and Research Center (MESTER). The first Center of its kind to be established in the Middle East, MESTER “supports the region’s efforts in driving sustainable tourism through investment in education scholarships, research grants and entrepreneurship support”. Other sponsors for 2016 event included: Khaled Ahmad Foudeh (KAF); Fiore Rosso; Mai Dubai; Giffard; Desert Stallion by CWS; Patchi; and Tonino Lamborghini. More information on The Middle East Hotel Awards and 17th annual The Hotel Show Dubai (17-19thSeptember 2016; Dubai World Trade Centre), can be found at www.thehotelshow.com.